Hogwarts School of Witchcraft and Wizardry is one of the three main wizarding schools in Europe and considered one of the finest schools in the wizarding world. It is a boarding school that services the United Kingdom of Great Britain and Northern Ireland, and the Republic of Ireland. 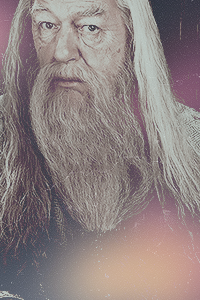 The most famous alumni include Albus Dumbledore, Harry Potter, and Lord Voldemort. This overview has been created to provide interested role players with the background information required to create a successful Ilvermorny character. School term begins in September and ends in June. And learn until our brains all rot! *Hogwarts School of Witchcraft and Wizardry, it's design, layout, contents, houses, descriptions, canon characters and all related images and indicia are the creation of J.K. Rowling and are copyrighted by Warner Brothers, © 2001-2018. Some Rights Reserved. No part of this publication may be reproduced, distributed, or transmitted in any form or by any means, including photocopying, recording, or other electronic or mechanical methods, without the prior written permission of the magical-hogwarts.com administration, except in the case of brief quotations embodied in critical reviews and certain other noncommercial uses permitted by copyright law. All copyrighted materials, meaning the notion of Hogwarts School of Witchcraft and Wizardry, are for the sole purposes of creating plots in the present Harry Potter universe. All rights are reserved and respected to their original copyright owners. No copyright infringement of any kind is intended. None of the writers, contributors, administrators, or anyone else part of the magical-hogwarts.com community, in any way whatsoever, are connected to J.K. Rowling and/or Warner Brothers. Hogwarts School of Witchcraft and Wizardry was founded around 990 A.D. by the four brightest witches and wizards of the age: Godric Gryffindor, Helga Hufflepuff, Rowena Ravenclaw, and Salazar Slytherin. The castle was built in Scotland, in a remote area of the highlands away from prying muggle eyes; the 10th century was a dangerous time for witches and wizards, who were being persecuted by muggles. To this day, many of the details of the school's construction remain a mystery, though it is known that Rowena chose the location of the castle and came up with the ever-changing floorplan. Her close friend Helga gave house-elves their jobs in the kitchens, giving them somewhere they could work and be treated fairly. Hufflepuff was reportedly very good at food-related charms, and several of her recipes are still used at Hogwarts today. Each of the founders had traits they sought out in students, resulting in the four Hogwarts Houses - the founders themselves would handpick the students they wanted in their house. Hogwarts students were taught a variety of subjects, and would compete against each other for House Points. Before all the founders perished, however, they came up with a clever way to sort students into the right House after they were gone: Godric's hat. It was enchanted to sort students long after their deaths, and is still used today as the Sorting Hat. As time passed, tensions grew between the founders - particularly Godric Gryffindor and Salazar Slytherin. Slytherin was adamant that Hogwarts should only accept students of pure magical blood because he distrusted muggleborns, but the remaining founders disagreed. Gryffindor, who was known to be the greatest duellist of the time (both with a wand and with a sword), ousted Slytherin from the school. Before Slytherin left, however, he had secretly completed the Chamber of Secrets and housed a monster within, with the claim that his heir would one day release the beast and purge the school of all muggleborns. Salazar Slytherin was not the only founder with a story; Rowena Ravenclaw was considered the greatest witch of her time. She was blessed with intelligence and wit - even before she wore her enchanted diadem, which was said to enhance the wisdom of the wearer. Rowena's magical prowess was a sore spot for her daughter, Helena, who stole her mother's diadem - believing it would make her powerful - and ran away from Hogwarts. Rowena was embarrassed by her daughter's actions, and told no-one until she was on her death bed. She sent a man after Helena, who found her in Albania, but when she rejected his advances the man killed her. They became the Grey Lady and the Bloody Baron, house ghosts of Ravenclaw and Slytherin, respectively. Rowena died shortly after, reportedly from a broken heart; the first of the founders to die. It is unknown how Godric, Helga, or Salazar died, though each left an enduring legacy upon the school they founded. Hogwarts is located near Dufftown, in the Highlands of Scotland. It is surrounded by mountains and lochs, with many pine forests. The actual location of the school is unplottable, and if a muggle were to chance across the castle, they would see a ruin with signs warning them the structure is dangerous and not to be entered; magical wards also cause muggles to suddenly remember important appointments elsewhere that they must hurry home to. The castle is situated on sprawling grounds that include sloping lawns, a deep lake, and a large, dense forest. Due to its north-eastern location within Scotland, the area surrounding and including Hogwarts is receives low rainfall but a large number of snow days (parts of the Highlands have an average of 46 to 105 snow days per year). The average low temperature in winter across Scotland is around 0 °C (32 °F), and summer maximum temperatures average 15–17 °C (59–63 °F). However, temperatures at Hogwarts (and Hogsmeade) will likely be slightly below this. Scotland is the windiest country in Europe, and sunshine hours are somewhat low - on average the sun shines just over 25% of the time. Hogwarts is a seven-storey stone castle. The highest tower is the Astronomy Tower, followed by the Gryffindor and Ravenclaw House Towers. The castle has one-hundred-and-forty-two staircases, including the grand staircase. The castle was built in 993 AD by the four founders of Hogwarts: Godric Gryffindor, Helga Hufflepuff, Rowena Ravenclaw, and Salazar Slytherin. The castle is imbued with magic and over the many, many years has become semi-sentient, known to protect itself and its inhabitants. Hogwarts is home to many secrets, with some rooms, corridors, and passageways on no known maps. There are also rooms, such as the Room of Requirement, which only appear under certain circumstances. In addition to the staff and students, Hogwarts hosts several ghosts and a poltergeist. The Great Lake has a tribe of merpeople, and the Forbidden Forest is home to a herd of centaurs, as well as many other creatures. Hogsmeade is the only all-wizarding town in Great Britain, founded by Hengist of Woodcroft fleeing muggle persecution many centuries ago. Hogsmeade is to the Northwest of Hogwarts and can be accessed by the cobblestone road connecting the school to the village. Since 1714, third-year students and above have been permitted to visit the village on weekends with a signed permission slip from parents or a legal guardian. Hogsmeade is a festive little village with thatched cottages, cobblestone streets, traditional pubs and restaurants, and many specialized shops with varying merchandise and services. It is particularly picturesque covered in snow in the winters. The village offers a several things to do, whether one is interested in afternoon shopping or having a pint at one of the town’s famous pubs. Other attractions and shops include the Hogsmeade Post Office, the Hogsmeade Railway Station, Baby Witch, Brews and Stews Cafe, Ceridwen's Cauldrons, Dogweed and Deathcap, Dominic Maestro's Music Shop, the famous Honeydukes, a hairdresser & salon, J. Pippin's Potions, The Magic Neep, McBloom & McMuck, McHavelock's Wizarding Headgear, a local branch of Ollivanders, Pedrus Pridgeon, Rosa Lee Teabag, Scribbulus Writing Implements, and a developing outlet of Weasley's Wizard Wheezes in the old Zonko's building. A full overview of the shops of Hogsmeade can be found in the more extensive Hogsmeade Village Guide. d e a r m r . p o t t e r . . .
Hogwarts accepts students of all magical ability who were born in the British Isles. This includes: England, Wales, Scotland, Northern Ireland, Republic of Ireland, Isle of Man, and the Channel Islands. There is no discrimination against blood status, despite the many issues Wizarding Britain has faced in the past with regards to pureblood supremacy. The Quill of Acceptance is a magical quill that records the name of every eligible child in a large book (kept in the school). The Quill stirs at the slightest hint of magical ability in a child, however The Book of Admittance may slam shut if there is insufficient evidence that a child's magical ability has manifested - this is to ensure that no squib is accidentally admitted to Hogwarts. The Book is checked each year by the current Deputy Headmaster or Headmistress, who then sends out letters to all children from wizarding families inviting them to attend Hogwarts the following term. For any child of muggleborn ancestry (or who has otherwise found themselves in a non-magical household), a representative from the Ministry of Magic (known as a Muggleborn Introductory Officer) is dispatched to the home of the child to deliver the letter in person. There is no fee to attend Hogwarts (school running costs are covered by generous private donations and the British Ministry of Magic). Students do have to purchase their own supplies, such as uniform, writing materials, textbooks and so on. There is a hardship fund for students who would not be able to afford the required equipment without assistance. The only language spoken at Hogwarts is English. Though students may be proficient in other native (Gaelic, Welsh) and non-native (French, German) languages, it is considered rude to speak these in the presence of those who may not understand. There isn't a punishment for speaking languages other than English on school grounds (outside of lessons and clubs), but it is discouraged for this reason. The large majority of students will arrive at Hogwarts via the Hogwarts Express, a steam train which travels from London. Students must make their way to Platform 9¾, at King's Cross, in time to make the 11 a.m. departure. The train's destination is Hogsmeade Station; should a student miss the train, they must make their own way to Hogsmeade in time for the beginning of term. Other methods of transport include Floo, Apparition (side-along for Underage Wizards), and broom, but again one must arrive in Hogsmeade village as it is impossible to travel directly to Hogwarts due to the many wards in place. Once students have arrived in Hogsmeade they travel in carriages pulled by Thestrals (which are invisible to all who have not witnessed death) from the village station up to the school, excluding first years who traditionally cross the Black Lake in small boats with the current Gamekeeper to the castle's underground harbour. Students may travel home for the Christmas holidays (via the Hogwarts Express, or collection from Hogsmeade village), but are not permitted to leave the school during term. The only exceptions to this being Hogsmeade weekends, or family circumstances such as a bereavement. Hogsmeade weekends are organised by the school and students require parent or guardian permission. Leaving the school for exceptional family circumstances is generally arranged between the student's family and their Head of House and/or the Headmaster or Headmistress. At the end of the school year students return home, generally in the same manner they arrived at the school - whether that be train, floo, broom, apparition, and so forth. The Sorting Ceremony takes place at the beginning of every new term at Hogwarts. Whilst the first years wait nervously in the Chamber of Reception, just off the Entrance Hall, the rest of the school takes their seats at the house tables in the Great Hall. First years are then brought into the Hall and called, one at a time, alphabetically, to sit upon a stool in front of the entire school. The Sorting Hat is then placed upon their head, and will determine the house to which the young witch or wizard belongs. Right before the first student is called up, however, the Hat sings a song which changes every year. It usually describes a little of each of the houses, but may also encourage school unity or warn of danger. The Sorting Hat is a sentient object, and uses Legilimency to read the thoughts and memories of the wearer. The time taken to consider which house a student belongs to varies in length from over five minutes (known as a "Hatstall", when an individual strongly displays traits from more than one house) to less than a second. Once the Hat has made its decision it loudly announces the chosen house for the entire school to hear, and the student joins their new house ready for the Welcome Feast. There are four houses at Hogwarts, named after the founders: Gryffindor, Ravenclaw, Hufflepuff, and Slytherin. Houses are like a student's family whilst at school, and students of the same house share a common room and dormitories. Each house has traits that it values, and is represented by signature colours and an emblem. 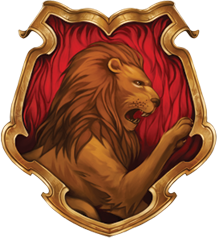 Symbolised by the lion and the colours scarlet and gold, the house of Gryffindor values courage, boldness and chivalry. Students chosen for this house are known best for their adventuresome natures and high sense of honour, doing what is best and right for themselves and others. Loyalty in friendship is also a trait often found in this group, giving them a sense of family within them. Founded by Godric Gryffindor who believed that all who possessed magical ability would be allowed to attend Hogwarts, Gryffiindor is reported to be from Yorkshire and originally owned the Sorting Hat. The Gryffindor Common Room and Dormitories are located in the Gryffindor Tower, the entrance to which is located on the seventh floor behind a painting of a fat lady in a pink silk dress. The house ghost is Sir Nicholas de Mimsy-Porpington (Nearly Headless Nick) and past Gryffindors of note include: Albus Dumbledore, Minerva McGonagall, Rubeus Hagrid, the entire Weasley family, Sirius Black, Lily Evans, Remus Lupin, Peter Pettigrew and James Potter. 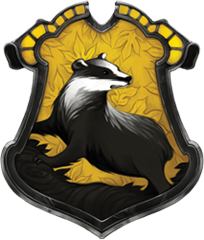 As the most inclusive among the four houses, Hufflepuff is symbolised by the badger and it's colours are yellow and black. Valuing hard work, determination, strength, patience, friendship and fair play instead of a particular aptitude among it's chosen. Members of this house are most known for those who don't exactly fit in either of the other three houses. Beloved for her charming ways and ability to bring together people from all walks of life, the founder of this house was Helga Hufflepuff, reported to hail from Wales. The Hufflepuff common room is located in the basements near the kitchens. The house ghost is the Fat Friar and the most famous Hufflepuffs include Cedric Diggory, Newt Scamander, and Nymphadora Tonks. 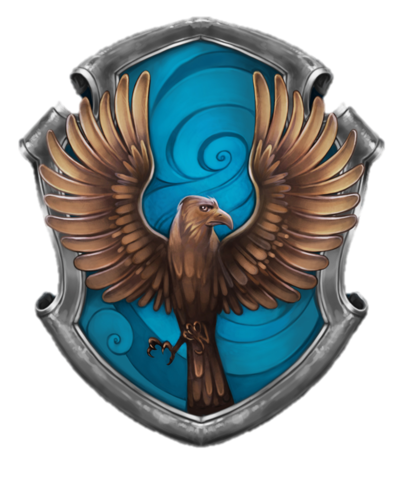 With the emblematic animal of the eagle and the colors of blue and bronze, Ravenclaw house desires those students who are full of intelligence, knowledge and wit. Ravenclaws are overwhelmingly described as being fair, handsome or beautiful and this trait may be one that is sought after during the sorting process. The founder, Rowena Ravenclaw, is described as being 'fair' and hailing (reportedly) from Scotland. According to her Famous Wizard card she's best remembered for her creativity and intelligence and for inventing the ever-changing floor plan. The Ravenclaw common room is located on the west side of the castle in Ravenclaw tower. The house ghost is they Grey Lady and the most famous former Ravenclaw is Filius Flitwick. 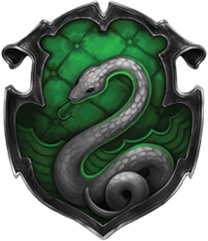 Known most for favoring blood purity, Slytherin is represented by the serpent and the colours green and silver. Traits strong in this house include ambition, resourcefulness and cunning; along with a certain disregard for the rules when it comes to personal wants and needs. The only house that factors blood into the sorting, it is not actually the individual's heritage that comes into question but more their personal view point on the subject. Founded by Salazar Slytherin, a parselmouth, he believed that only pure-blood witches and wizards should be allowed to attend Hogwarts. The many arguments on the subject between Gryffindor and Slytherin eventually led to Slytherin's leaving the school, though not before sealing the Chamber of Secrets, inside which he sealed also a monster that only his heir would be able to control. The plan was to rid the school of all Muggleborns, but was unsuccessful. Reportedly from Norfolk, North East of London, there is some evidence that Slytherin was different than others around him, being described as "ancient and monkey-like". Located under the lake, the Slytherin common room is a low-ceiling dungeon-like room. The house ghost is the Bloody Baron and former Slytherins of note include: Tom Marvolo Riddle, Severus Snape, Regulus, Bellatrix and Narcissa Black, and Rodolphus Lestrange. The House Cup is a competition between the Hogwarts houses. Each house competes for House Points, which may be awarded by any Professor or earned from Quidditch matches, and deducted by Professors, the Head Boy and Girl, and Prefects. There is no “prize” for winning, but it is still a great achievement for a house. Each house has two Prefects, a boy and a girl, respectively, who are chosen each year. Prefects are usually students in their fifth year and above. They should be role models for other students; able to follow and enforce rules, keep up with (and preferable excel in) their studies, and have good leadership skills. They have the ability to take away house points from their own house by advising their Head of House of any rulebreaking. Every year the Headmaster or Headmistress selects two students for the positions of Head Boy and Head Girl. Usually these individuals have previously been Prefects, however it is not unheard of for Head Boys and Girls to be students who have never held another student position. They are senior to Prefects, but are otherwise given the same responsibilities. Being made Head Boy or Girl looks very good on one’s record when applying for jobs. Quidditch captains are also given similar rights as prefects, like the password to the prefect's bathroom, but are not allowed to dock points. Their primary focus is to organise and coach their House Quidditch team. This includes organising team try-outs, practices, and ensuring the team has a full roster for games. They should be a good example to the rest of their team, and able to lead effectively. Captaincy during school is always seen positively by Professional Quidditch team scouts. There are also club and society "leaders". Generally these individuals are chosen by members of the respective student organisation and do not have any official responsibilities other than to organise club meetings and events. There are a number of student-led school clubs. These include, but are not limited to: chess club, gobstones association, duelling club, charms club, choir, art society, magical language society, orchestra, potions club. For current club leaders and members, see the Hogwarts School Clubs and Associations topic. Hogwarts students are required to wear their school uniform during class hours, this is from 8.30 a.m. until 4 p.m., Monday to Friday. Outside of this, they may wear their personal clothes (or may remain in uniform). Personal clothes should still be suitable for a school environment - no bare midriffs, necklines should be tasteful, no excessive jewellery and so on. The Hogwarts school uniform consists of: white collared shirt or blouse with house-coloured tie, grey sweatshirt, black skirt or trousers (no shorts), and black dress shoes. Students must also have a set of Hogwarts robes to be worn for the start- and end-of-term feasts and any other official school requirements, and a winter cloak (black, with silver fastenings). Skirts must be no shorter than two inches above the knee, and socks worn with skirts may be ankle- or knee-length. Students may wear wristwatches and minimal jewellery (stud earrings, rings, necklace). Quidditch team members are provided with House robes for games. For flying lessons, students must wear sports gear, such as leggings, shorts, t-shirts and trainers (plain white t-shirts and dark-coloured shorts/leggings are preferred). Personal protective gear is required for Herbology and Care of Magical Creatures classes, such as gloves (dragonhide or similar). The “school week” runs Monday to Friday, with Saturdays and Sundays off. The day begins at 7:30 a.m. with breakfast in the Great Hall; this includes getting mail. Students may come to breakfast in their own clothes, or may wish to be ready for the day ahead as classes begin at 8.30 a.m sharp. Students may have “free periods” in their day, during which they are expected to complete their homework and group projects. When classes are finished for the day, students have “free time” which may also be used for homework, or otherwise socialising. Dinner is served from 5 p.m. until 7 p.m., and students may arrive for dinner at any time in those two hours - the only exception is for feasts, where students are expected to arrive promptly and sit with their House. Dinner is followed by more free time (any detentions are usually completed during this time), however students are expected to be back in their respective Common Rooms or Dormitories by 8 p.m. Prefects may be required to walk the halls up until 10 p.m., by which time all students should be in bed. On Magical Hogwarts, only some of the classes taught at Hogwarts are actually role-played out. You may still mention non-played classes in your posts just as you might any other. Below you will find a list of all classes offered to the students of Hogwarts. In canon, core classes are required from first year until fifth year, and become an optional subject thereafter. Elective classes are chosen at the end of second year to begin from third year onwards. Sixth and seventh year students choose their classes based on their future employment goals, using the results of their O.W.L.s (taken at the end of fifth year). Some professors will not allow students into N.E.W.T. level classes if they have not achieved sufficient O.W.L. grades. On Magical Hogwarts, we do not require you to take specific classes - electives are open to all students. The current Professors can be found in the Positions thread. A primarily theoretical class, Astronomy is the study of constellations and celestial bodies. Students generally have this class late at night in the Astronomy tower, using their telescopes to learn about the planets, stars, and their movements - and how the alignments affect other branches of magic, such as potionmaking. Charms is both a theoretical and practical subject. This class aims to teach the fundamental spells needed to improve the overall quality of a wizard’s life. Charms is a method of magic used to enchant everything from objects to people. Defence Against the Dark Arts teaches students how to defend themselves against all manner of dark magic, including but not limited to curses and hexes, but also covers dark creatures. This class has a mix of theoretical and practical components - with some aspects theory-only due to the dangerousness of some spells and creatures. A primarily practical class, though still with a fair amount of theory, Herbology is where students learn to care for magical plants, in addition to what their properties are - which plants are used in potionmaking, or can foretell the future in Divination, which are edible, or used for healing, or are indeed poisonous or deadly. A purely theoretical class, History of Magic is exactly what the title suggests: the class covers history from the earliest known witches and wizards, up until the present day. Younger students generally focus first on important historical events like the witch trials, followed by slightly less exciting topics such as goblin rebellions. Potions covers the practical aspect of potionmaking, in addition to ingredient preparation, and storage of completed and in-progress potions. The theoretical side of the subject goes over ingredient uses, and also incorporates some information from other subjects, such as how the positioning of planets, moons, and stars affect the brewing process, or how poorly grown or stored ingredients can negatively affect a final product. Transfiguration is the art of changing items, and creatures, into other things. This may be as simple as changing a matchstick into a needle, or more challenging, like a mouse into a teacup, all the way up to the most challenging of transfiguration spells like animating stone statues. This class covers both theory and practical aspects of the subject. Ancient Runes is a primarily theoretical class that deals with translating runes, including native runes from the British Isles but also magical hieroglyphs and runic scriptures from other nations. As students progress they may also learn how to use runic magic. In Airthmancy students discover the use of numbers in magic. This class is both theoretical and practical. Recommended for students who wish to work in the banking or financial sector, however Arithmancy is useful in various areas of magic. Care of Magical Creatures covers the keeping and caring of various magical creatures. Students learn, both in the classroom and out in the field (depending on the dangerousness of the creature), how to look after everything from puffapods and nifflers, to phoenixes and dragons. The art of Divination is strongly believed to be something that must be inherited, rather than learned, however in this class students are taught how they might foresee future events or understand those of the past. Various aspects of Divination are taught, from using tea leaves and palmistry, to understanding dreams and using the crystal orb. In this class students learn how to fly a broom, in addition to some basic good broomkeeping skills and maintenance. Students begin with the basics such as calling their broom to them, taking off and landing, and may progress to obstacle courses or even mock Quidditch games. Students learn about muggles and the many ways they have overcome a lack of magic to improve their quality of lives. Topics covered include electricity, cooking without magic, how to dress like a muggle, mundane transport, and muggle culture (films, books, and music). Students who progress to N.E.W.T. level can expect to learn about muggles from other countries, and how their lifestyles vary from that of British muggles. To earn a score of "O," you have gone above and beyond all requirements and expectations. Accordingly, the student is present for all or nearly all lessons and shows distinct promise in the field. These are extremely rare. To earn a score of "E," your paper has been exceptionally written. This is well above average; extraordinary. In Archaic times, this meant "superior," and that’s exactly what an "E" student is. To earn a score of "A," your paper is well written and directly answers the questions asked. The student is present for nearly all lessons and participates actively. An "A" is recommended for any students wishing to pursue any subject at the N.E.W.T. level. To earn a score of "P" means you did not answer all questions asked or they were not answered correctly, and didn't reference the corresponding lesson (correctly). However, the student does show a mild understanding of the material covered. Likewise, the student shows some, albeit weak, comprehension of the subject matter. To earn a score of "D" means many of the questions were not answered correctly or are missing, and the lesson is not referenced. Little understanding of the lesson is displayed. Homework was possibly completed with minimal to no effort in some cases. Tutoring is recommended. One does not earn a "T;" rather, they call it upon themself. No attributes of a Hogwarts student are displayed. This student might as well be a troll. 31 October - All Hallows' Eve, or "Hallowe'en" as it is most commonly known in the present day, is an celebration observed across the British Isles. Traditionally, it begins the three-day observance of Allhallowtide, which is a time dedicated to remembering the dead. It is widely believed that many Hallowe’en customs and traditions originated from ancient Celtic harvest festivals, particularly the Gaelic festival Samhain and the Welsh equivalent Calan Gaeaf (known in Cornwall as Kalan Gwav). In the modern day, Hallowe’en is celebrated by both religious and non-religious people. Hallowe’en activities include: trick-or-treating, guising (dressing up in costume), carving pumpkins (or, more traditionally, turnips) into jack-o’-lanterns, bonfires, apple bobbing, divination games. More recently, it is also common to visit haunted attractions and watch horror films around this time. 5 November - Guy Fawkes Night, also known as Bonfire Night, is an annual commemoration of the night the Gunpowder Plot failed. On 5 November 1605, Guy Fawkes was arrested while guarding explosives the plotters had placed beneath the House of Lords. Celebrating the fact that King James I had survived the attempt on his life, people lit bonfires around London; and months later, the introduction of the Observance of 5th November Act enforced an annual public day of thanksgiving for the plot's failure. By the 20th century Guy Fawkes Night had become an enjoyable, sociable festivity. The present-day Guy Fawkes Night is usually celebrated at large organised events, centred on a bonfire and extravagant firework displays. Most events will include a "Guy", an effigy that is usually burned on the bonfire; children may ask for a "penny for the guy" - nowadays the money collected often goes to charitable organisations. 30 November - St. Andrew's Day is Scotland's national holiday. In Scotland, and other countries with Scottish connections, St. Andrew's Day is marked with a celebration of all things Scottish. This includes partaking in traditional food, music and dancing. In Scotland, the day is seen as the start of the county's winter festivals. This encompasses Burns' Night as well as Hogmanay. There is often a week long celebration in the town of St. Andrews, though the epicentre of the festivities is Edinburgh. The Royal Mile in Edinburgh is decked out with The Saltire, of white and blue. There is music and laughter, the pubs are packed with people and the sound of bagpipes are never far away. People in Scotland also pin thistles and heather to their hats and their clothing. In Edinburgh, as night falls, story-telling is a popular event on St. Andrew's Day. There are also plenty of market stalls selling traditional wares, from scarves and sweet treats, all the way to hand knitted jumpers and locally sourced whiskey. This is a time for the fiercely proud and patriotic Scots to celebrate their country, heritage and their future. 31 December - Known in Scotland as "Hogmanay", in Wales as "Calennig", and in the rest of the British Isles simply as "New Years Eve"; this is the last day of the calendar year. For Hogmanay, customs vary throughout Scotland but usually include gift-giving and visiting the homes of friends and neighbours, with special attention given to the "first-foot" - the first guest of the new year. First-footing involves going to friends or family members' houses with a gift, usually whisky but sometimes a lump of coal. The largest Scottish cities – Edinburgh, Glasgow, and Aberdeen – hold all-night celebrations, as do Stirling and Inverness. Edinburgh's Hogmanay celebrations is one of the most famous in the world. Calennig is the Welsh tradition of giving gifts and money on New Year's Day that still survives in the present-day, however it is now customary to give bread and cheese. Cardiff, the capital city, hosts a celebration which includes music, fairground rides, and a fireworks display. New Year's Eve festivities across the rest of the British Isles vary from small social gatherings in homes to large-scale organised events. Common at all of these however, are dancing, eating, drinking alcoholic beverages, and setting off fireworks. 25 January - A Burns supper is a celebration of the life and poetry of the poet Robert Burns (25 January 1759 – 21 July 1796), the author of many Scots poems. The suppers are normally held on or near the poet's birthday, 25 January, occasionally known as Robert Burns Day (or Robbie Burns Day or Rabbie Burns Day) but more commonly known as Burns Night (Scots: Burns Nicht). Burns suppers may be formal or informal. Both typically include haggis (a traditional Scottish dish celebrated by Burns in Address to a Haggis), Scotch whisky and the recitation of Burns's poetry. February or March - Shrove Tuesday (also known in Commonwealth countries and Ireland as "Pancake Tuesday" or "Pancake day") is the day in February or March immediately preceding Ash Wednesday (the first day of Lent), which is celebrated in some countries by consuming pancakes. In others, especially those where it is called Mardi Gras or some translation thereof, this is a carnival day, and also the last day of "fat eating" or "gorging" before the fasting period of Lent. Pancakes are associated with the day preceding Lent, because they are a way to use up rich foods such as eggs, milk, and sugar, before the fasting season of the 40 days of Lent. In the modern day, Shrove Tuesday is celebrated by both religious and non-religious people. 14 February - Valentine’s Day, also called Saint Valentine’s Day or the Feast of Saint Valentine, is a celebration of romance and romantic love. Celebrated around the world, customs vary, but generally lovers express their feelings through gifts of flowers, confectionary, and greetings cards. Popular symbols of the day include hearts, doves, and the figure of Cupid. In Wales, some people celebrate Dydd Santes Dwynwen (St Dwynwen’s Day) on 25 January instead, which is the day of the Welsh patron saint of love. 1 March - Saint David (Welsh: Dewi Sant) is the patron saint of Wales, and on this day (the date of his death), all things Welsh are celebrated. Traditional festivities include: wearing daffodils and leeks (symbols of Wales and of Saint David, respectively); eating traditional Welsh food including cawl, laverbread, bara brith, and Welsh rarebit; and women wearing traditional Welsh dress. It is common to see the Flag of Saint David (a yellow cross on a black field) being flown at this time of year as well as the official Flag of Wales (Y Ddraig Goch). Several cities and towns (including Cardiff, Swansea, and Aberystwyth) put on parades. 17 March - The Feast of Saint Patrick (Irish: Lá Fhéile Pádraig, “the Day of the Festival of Patrick”) is a celebration of the Irish patron saint, held on the date he died. It is a celebration of Irish heritage and culture, and festivities generally include public parades and festivals, cèilidh (social gathering that involves dancing and playing Gaelic folk music), and wearing green attire or shamrocks. It is a public holiday in the Republic of Ireland and Northern Ireland, and is also widely celebrated around the world - it is celebrated in more countries than any other national festival, including in the rest of the countries in the British Isles. 1 April - April Fools’ Day, sometimes called All Fools’ Day, is an annual celebration commemorated in April 1st by playing practical jokes and spreading hoaxes. The jokes and their victims are called “April fools”. Some newspapers, radio, and other media report fake stories, which are usually explained the next day or below in a smaller print. However, in the United Kingdom joking typically ceases at midday, with anyone playing a joke after this time is the “April Fool” themselves. 23rd of April - St. George is the patron saint of England, England chose this date as it is widely recognised as the day St. George died. While it is acknowledged by the UK government, St. George's Day is not actually a bank holiday. Unlike the other patron saint days, St. George's Day is considerably more relaxed. There are usually small get togethers, parades and fayres celebrating St. George and his slaying of the dragon. The most popular thing to do during St. George's Day is to wear a red rose, the symbol of England, in a button hole or a lapel. More recently, St. George's Day has undergone a revival. Nowadays, St. George's Day is more about celebrating all things English, however obscure they be. Things such as cheese rolling, morris dancing, Punch and Judy shows and fish and chips are all celebrated during the day. There is a lot of traditional English food and drink consumed during the day, as well as pubs festooned with the St. George cross, bunting and flags. 1 May - There are a number of native celebrations held on the first day of May. In England, May Day is a spring festival where dances, singing, and cake are usually part of the celebrations. A “May Queen” is usually crowned, and celebrations are often focused around a maypole. In Ireland, Beltane (Irish: Lá Bealtaine) is the Gaelic May Day festival, historically observed widely throughout Ireland, Scotland, and the Isle of Man. Beltane marks the beginning of summer; bonfires are lit, yellow flowers (such as primrose, rowan, hawthorn, gorse, hazel, and marsh marigold) were placed at doorways and windows in the 19th century. Designated May Bushes (household or communal) were decorated with bright flowers, ribbons, painted shells, and so forth. In Wales the first day of May is known as Calan Mai or Calan Haf, and is similar to the Beltane festival. Traditions generally start the night before (Nos Galan Haf) with bonfires, and it is considered a Ysbrydnos or “spirit night” when people would gather hawthorn and flowers to decorate their houses, celebrating new growth and fertility. On May Day itself, celebrations would include summer dancing and singing May carols.